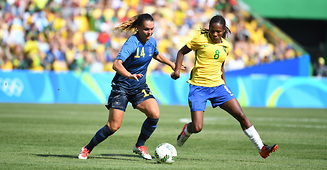 In the spirit of the approaching FIFA Women’s World Cup to be held in France in June 2019, UNESCO, together with the French National Union of Professional Footballers (l’Union nationale des footballeurs professionnels – UNFP) and the French Institute for International and Strategic Affairs (IRIS), will work together to advance the promotion of women’s football on the world stage. The will of these three actors is to advance, each at its own level, gender equality and equity in women’s football, and to promote its inclusive role in society. UNESCO, UNFP (link is external) and IRIS (link is external) announce officially, on Wednesday 28 March 2018, the launch of a study to promote women’s football internationally. The study has three main objectives. It will first determine the status of women’s participation in football at all levels (including amateur, professional, coaching and administrative or managerial positions). Secondly, it will identify the barriers to their participation. Finally, based on quantitative and qualitative analysis collected through the study, the partners in this project will provide concrete recommendations for public authorities, sport bodies and the general public to promote and develop gender equality and female empowerment through football. The study also intends to provide a clear picture of the status of women in football and prompt action for advancing gender equality in football. Coordinated by UNESCO and IRIS and carried out with the support and participation of the UNFP, the final report will compile research and surveys involving a team of international experts, researchers and associations from around the world. The results of the study will be published in the weeks preceding the launch of the FIFA Women’s World Cup.